Lightweight with a collapsible design, Chief's MFC cart includes telescoping height-adjustment, integrated cable management, and is quick to assemble/disassemble. Perfect for rental and staging to corporate applications. 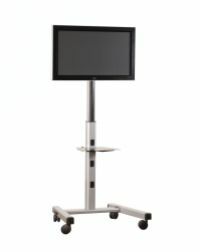 Designed specifically for presentations, Chief's PPC Presenters Cart is perfect for business applications, accommodating a single large flat panel TV, plasma screen or other large display up to 61". Streamlined design eliminates trip hazards, allowing presenters to move freely around the display and even roll the cart up to a conference table for better viewing.